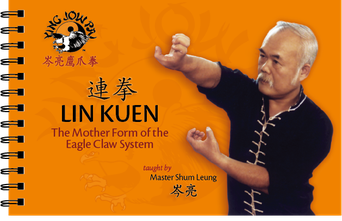 The definitive guide book to the all-important Eagle Claw form, Lin Kuen! This high quality, wire bound, 84 page limited edition manual includes each step of the form demonstrated by Grandmaster Shum, with step by step instructions.
" LIN KUEN by Master Shum Leung, is an historic work that embodies the essence of this classical Northern Style. The form was long jealously guarded and passed down only to senior students, and even today, many masters still refuse to teach it to outsiders. The book reveals the form to the general public for the first time in the English language. That we are able to view each technique through the personal demonstration of Master Shum Leung, a giant in the Eagle Claw System, makes the book indispensable for all Eagle Claw practitioners and a valuable addition to the library of any martial artist. The section on breathing is especially significant and is not only necessary for the proper practice of Lin Kuen, but is also a useful aid for martial artists interested in developing the smooth power that one strives to generate in the execution of each technique. This is a workbook that is meant to be carefully studied. The spiral binding is ideal for laying the book flat, a practical way to reference the book while refining one’s techniques."